More Jewellery in a Jiffy looks average on the outside, but is filled with so many beautiful and inspiring ideas that even the most reluctant crafter might want to give beading a go. 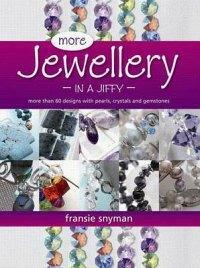 Fransie Snyman has this ability to make it seem like anyone can open this book and create classy and timeless necklaces, or funky and bright earrings and bracelets. 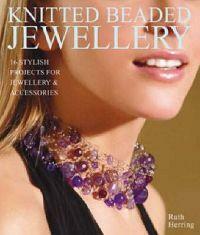 It’s filled with plenty of original and unique designs using pearls, crystals and gemstones. If you’ve never tried any serious beadwork and feel a bit intimidated by clasps and crimp beads, this is the perfect book for you. Fransie quickly gets down to business by outlining the basics. She shows you some of the core beading techniques, like how to make eyelets and special knots. There are also lists of tools and beading accessories that you’ll need. Everything is accompanied by large, labelled photographs. This is a plus for someone like me who doesn’t know the difference between a slider and a spacer. Fransie has split her projects into categories, so it’s easier to find something specific. The first project category is “Bracelets”, with eight designs to choose from. Other categories include “Spacer Savvy”, “Pearls”, “Gemstones”, “More Gemstones”, “Cluster Earrings”, “Earrings in a Flash”, “Crystals”, and “Crystal Balls”. All the projects include step-by-step thumbnails and clear instructions. Some of her pieces can be completed in a few minutes, while others can take up to two hours, making this book great for the impatient crafter – or someone who loves getting involved in the task at hand. 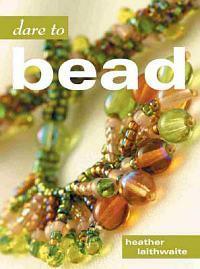 Whether you’re a beginner or an advanced beader, you’ll find something suited to you in this stunning book. With gorgeous photography and such a huge selection of necklaces, bracelets and earrings to make, More Jewellery in a Jiffy is definitely a winner. Just in time for Christmas, Knitted Beaded Jewellery offers you a creative way of making really special, one-of-a-kind gifts for your nearest and dearest. Combine your knitting and beading skills to make the daintiest jewellery and accessories out of wools and cottons; or be a little adventurous and try working with wire or leather. The book is divided into four sections starting with basic, beginner projects using beads and simple techniques. The projects in the sections that follow increase in difficulty – I recommend starting with one of the easier projects, like a ring or two, to get your creative juices flowing. All in all, there are a choice of 14 different designs from which to make earrings, necklaces, chokers, wrist- and anklebands, hairbands, rings and even handbags. It really is up to you how creative you’d like to be, as the designs are versatile enough to embellish with as many beads, sequins and sparkly bits as you like. If you’re brave enough, you could even adapt the techniques to make gorgeous Christmas tree decorations. As someone who is fairly crafty but inexperienced in this area, I was impressed by the detailed instructions, skill level indicator, tips and step-by-step photos and captions for each project. I also found the introductory Materials and Equipment and Techniques sections to be very useful. There, the author starts from scratch by teaching you all about different types of beads, equipment, measurements, abbreviations and techniques; right down to holding the needles, how to thread wire and how to finish off your projects – very useful to page back to as you get going. 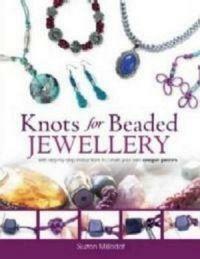 The third book by Susan Millodot, following Chinese Knots for Beaded Jewellery and Celtic Knots for Beaded Jewellery, this book once again encompasses the passion of jewellery crafting with the intricacies of knot work in a range of projects to delight those who love to make their own jewellery. The book offers crafters helpful sections on the various types of knots used in knot work, as well as the tools needed to attempt the projects, and the types of cord used in each. There is even a section on how to dye your own cord, for those adventurous enough to try it by following the instructions given in a simple step-by-step format. The projects in the book are amazing, and when finished would make eye-catching additions to anyone’s jewellery collection. The photographic instructions accompanying each project are fantastic, and leave no doubt as to how to complete the step being taught. This book makes knot work possible for a very beginner crafter, and with a little patience the knot work becomes quite addictive! An amazing book with beautiful projects in it, and a definite must have for crafters wanting to learn something different and unique. If the colours and shapes of beautiful beaded objects delight you, but the words "bugles", "Nymo", "thread zapper" and "spiral rope" sound suspiciously like Greek to you, then get your hands on this colourful, informative book and start beading right away. Heather's love for colour is evident throughout the pages, as is her creative skill. The book is designed to be worked through from start to finish - each project adds a new skill to your repertoire, and builds on those that precede it. Don't worry about getting lost in complicated patterns and instructions - everything you need to know is explained in plain, simple language, and you'll be reading patterns like a pro in no time. The illustrations and photographs are well thought-out and really do complement the text instructions, making them extremely easy to follow. All in all, Dare to Bead is a really good introduction to beading, and for those who've already done a few classes, this is a good way to consolidate your knowledge and learn a few new techniques, such as tassels, spiral rope, brick stitch and peyote stitch. Also available in Afrikaans as Waag met Krale.